China is a growing country economically, militarily, technologically, and globally. US policy should allow China to continue to grow, but in a way that protects American and world interests. Economy: Whether the United States or China sets the rules for global capitalism will determine how US workers and many throughout the world will fare in the modern economy. China is a legitimate and deserving economic power, but it also has a history of manipulating its currency, stealing intellectual property, dumping steel and other products onto American markets, and subsidizing its own companies. America must stand up to these unfair economic practices but thus far, from ZTE to tariffs, China is outmaneuvering the US. Military: China is also a rising power that is challenging the United States and is worrying US allies in the Asia Pacific region. The United States can support our allies through strengthened economic and military cooperation while avoiding direct military conflict. Technology: China‘s cyber capabilities are a national security threat to the United States. China has used cyber-attacks not only to steal intellectual property that belongs to US companies, but also to steal US military and intelligence secrets. The United States must strengthen its ability to protect against Chinese cyber-attacks and to pursue criminal cases against Chinese cyber attackers, when possible. Foreign Relations: A bad relationship with China is not inevitable. China and the United States have many common interests and a history of working together. The United States needs to balance competition with cooperation in our relationship to try and resolve both economic and global threats. China has a history of unfair trade practices that must and can be addressed without a devastating trade war. For years, China has taken advantage of our open, rules-based system of trade by subsidizing Chinese exporters and stealing US intellectual property, preventing US firms from fairly competing in China. The result is an uneven playing field with US workers and companies paying an unfair price. For both sides to fully realize the benefits of trade, the United States must insist that China plays fair. China must end its subsidies for Chinese exporters and other unfair trade practices that give their domestic businesses an advantage in overseas trade. And China must allow US firms to fairly compete in their country. Because innovation and openness are the sources of our economy’s vitality, a balanced trade policy would address all the ways China takes advantage of the system. At the same time, the United States must invest more heavily in technology and innovation of our own and strengthen cybersecurity against China’s espionage and theft of intellectual property. But a trade war is a lose-lose proposition because our economies are so interlinked. The Trump Administration has proposed new tariffs in various forms on Chinese imports. This is a blunt, ineffective instrument that could easily ignite a trade war, which would cost US exporters thousands of jobs and billions of dollars in revenue. A full blown trade war between the United States and China could involve a dramatic escalation of retaliatory measures on both sides, imposing steep tariffs on imports in specific sectors which would then devastate exporters on the other side. But at the time of writing this country brief, the Administration was trying to negotiate a framework to reduce the trade deficit with China, yet at the same time while still allowing the Chinese telecommunications firm ZTE—banned by Trump’s Secretary of Commerce—to once again access US markets.1 This is a mixed message to the American people and China, to be sure. But getting China to behave better doesn’t have to cost US jobs. The best way to rein in bad Chinese behavior is through international trade agreements like the Trans-Pacific Partnership (TPP). The TPP proved to be politically unpopular in the United States, but other measures that fall short of a trade war would limit joint ventures with China in areas where they steal intellectual property, sanctions on industries that are subsidized and state-sponsored, and vigorous prosecution of trade abuses through international courts. China’s growing military power and muscular foreign policy are alarming US allies…and US war planners. After World War II, the United States remained the dominant military presence in Asia to promote trade, security, and cooperation. As China rises, it is challenging this US presence and influence in the region and wants to take a more dominant role. This has led China’s neighbors—US allies like Japan to former adversaries like Vietnam alike—to draw closer to Washington. However, everyone in the region has much to gain from cooperation and much to lose from conflict, so we have to ensure our competition doesn’t lead to outright war. China aspires to return to the dominant position it enjoyed in Asia for thousands of years before going through a century of colonial rule. It has been translating its recent wealth into military power. Every year for two decades until 2017, China’s military budget increased by double digits, recently reaching $151 billion in 2017.2 While this still pales in comparison to the US defense budget—the Department of Defense requested $686 billion for fiscal year 20193—China’s increasing budget has allowed it to invest in new technologies aimed at deterring foreign aggressors while asserting its regional foreign policy aims. A small standoff in the South China Sea could snowball into a major conflict. While the United States does not take a position on the final settlement of territorial claims, arguing it should be a matter of negotiation involving all parties,8 the potential for major conflict could continue to grow. To cement its claims to territory, China has been building and militarizing islands in the South China Sea. These formations are part of a broader strategy to make it difficult for the US military to operate in the region during a conflict and form a buffer around China. The United States must reassure its regional allies and partners to combat Chinese aggression. While the United States initially assumed a dominant military position in Asia to prevent the reemergence of Japan as a military power after World War II, in recent years America’s presence serves as a check on China. The United States has mutual defense treaties in the region with Japan, South Korea, and the Philippines. Other countries in the Asia Pacific region also look to the United States to counterbalance China. Japan, alarmed by China’s growing military power, revised the country’s pacifist constitution and began building up its armed forces. The United States and the Philippines agreed in 2014 to strengthen US military presence in the Philippines.9 South Korea and the United States have regularly conducted joint military exercises (although President Trump committed to North Korean dictator Kim Jong Un to end these exercises in their recent summit regarding the North’s nuclear weapons).10 Besides these treaty allies, Vietnam has also strengthened defense ties with the United States. While the United States remains essential to the stability of the regional order—including the free flow of trade—as China grows in strength, the United States must reassure its allies and partners of America’s ability and willingness to protect them from Chinese aggression. Unfortunately, under the Trump Administration, the United States is signaling the opposite. In part to combat Chinese influence, the Obama Administration spearheaded the Trans-Pacific Partnership (TPP), which would have linked the United States with 11 other countries in Asia and Latin America in a wide-reaching trade pact. Part of the strategy of negotiating TPP was to encourage China, which was not a signatory, to reduce its barriers to trade so that it could one day join.11 While the Obama Administration did not say it was explicitly to counter China, TPP signaled a united diplomatic and economic effort by China’s neighbors and reassured them of US support. However, in January 2017, President Trump withdrew the United States from TPP,12 signaling to US regional allies that the United States cannot be trusted on its word and throwing away enormous economic and national security benefits to the United States. To stay ahead of China, the United States must invest in technology. China’s investments in technology are not merely aimed at catching up to the United States; in some areas, China seeks to become a leader. The most important new domain of Chinese military technological competition with the United States is increasingly Artificial Intelligence (AI), which China’s national leadership has said is a major stepping stone to eroding the United States’ edge. Major figures from Alphabet CEO Eric Schmidt to former Deputy Defense Secretary Bob Work warn that China will soon overtake the United States in AI, which the Chinese believe will not only dramatically boost economic growth, but also change the entire character of warfare.13 AI can improve autonomous systems, war-gaming, simulation, and information processing.14 If the United States falls behind in the development of AI and other sensitive technologies, China could hone battlefield advantages that will limit our ability to win a war, defend our allies, and defend the regional order we built after World War II. In addition to these evolving security threats, China has continued to invest heavily into diversifying and growing its nuclear weapon and ballistic missile programs—which poses a threat to the United States and its allies should conflict ever erupt.15 The country has also used its economic investments around the globe to push its agenda and gain a strategic foothold in many regions. There is no mistaking China’s intentions to challenge US dominance in the region and the world. To counter the threat of China militarily, the United States must continue to look for ways to strengthen our Asian alliances, including through the provision of ongoing economic and military assistance to these countries. This assistance must be focused on deterring Chinese aggression and strengthening the ability of the US to respond if needed. The United States must also ensure the US military and diplomats have the needed resources and capabilities they need to deter and rapidly respond to Chinese aggression against the United States and its allies. But if we wish to truly continue to play a dominant role in Asia and around the globe, the US must also get its house in order. China uses cyber capabilities to steal our secrets. Beyond the challenges that China poses in Asia, it is using its cyber capabilities to challenge the United States globally. China aggressively uses its cyber capabilities to steal not only intellectual property that belongs to US companies, but also US military and intelligence secrets. In 2015, China hacked the Office of Personnel and Management, stealing the private information of 22 million US citizens.16 China also steals military technology while cultivating contacts throughout the defense industrial supply chain and the US government. While this isn’t unusual—all nations seek to steal secrets, including the United States—the security stakes in the US-China relationship mean that Washington is still underinvesting in cyber capabilities and security, particularly since US technology is vulnerable to Chinese state-sponsored hacking. The US economy depends on the Internet more than ever, which makes China’s brazen use of its cyber capabilities worrisome. But cyber is also one area where the two countries may have succeeded in setting up some rules of the road. In 2015, President Obama and Chairman Xi Jinping agreed that their governments would not knowingly conduct cyber espionage against each other—though not government espionage—which led to a dramatic drop in cyber espionage the following year.17 The United States and China also agreed to cooperate against hackers, leading to the arrest of Chinese nationals who broke into OPM in 2015. This shows that by cooperating, we may protect our interests while avoiding costly escalation. Nevertheless, the United States remains woefully unprepared for cyberattacks that target critical infrastructure—including election machinery. It is possible that China could choose to take a play out of Russia’s playbook and interfere in US elections, as it has already been accused of meddling in Australia and New Zealand’s domestic politics.18 China’s eagerness to compete with the United States means that Congress must work with the Trump Administration to draw attention to this important issue while devoting more resources to securing US networks and infrastructure from Chinese hacking. An important law enforcement component of the US response to these cyber-attacks must also be to pursue criminal cases against Chinese cyber attackers to deter future attacks. American cooperation with China is necessary, where possible, despite China’s threats to the United States and its allies. As global powers with permanent seats on the United Nations Security Council, both China and the United States have the ability to veto decisions from moving forward. Because the United States needs China’s cooperation at the United Nations to solve many of the globe’s toughest problems—including North Korea, Iran, and countering terrorism—the United States must find ways to work with China when possible. Climate change was also a key area of cooperation between the US and China in the past, though President Trump foolishly withdrew the United States from the historic Paris Agreement aimed at tackling this global threat. Some US states have continued to push forward on the issue, and are maintaining cooperation with China on mutual climate goals.20 Because we need to cooperate with them on so many issues that matter to everyday Americans, the United States has to balance competition and cooperation with China so that we don’t lose sight of the interests we share in common. In part, this can be achieved by strengthening diplomatic channels with Chinese government entities so the US can continue to look for places where cooperation is possible. The security and economic challenges in the US-China relationship are considerable, but there is great opportunity, too. As both nations increase their trade links, innovate, and create new scientific knowledge, all of humanity can benefit. Given the security and economic stakes involved, both governments must think long-term by managing disputes and competition through candid diplomacy and ensuring close military-to-military communication to avoid unnecessary escalation that could inflict needless damage on both countries. United States White House, Office of the Press Secretary, “Joint Statement of the United States and China Regarding Trade Consultations,” May 19, 2018. Accessed June 11, 2018. Available at: https://www.whitehouse.gov/briefings-statements/joint-statement-united-states-china-regarding-trade-consultations/. Michael Martina and Ben Blanchard, “China confirms 7 percent increase in 2017 defense budget,” Reuters, March 6, 2017. Accessed July 12, 2018. Available at: https://www.reuters.com/article/us-china-parliament-defence/china-confirms-7-percent-increase-in-2017-defense-budget-idUSKBN16D0FF. United States Department of Defense, “DoD Releases Fiscal Year 2019 Budget Proposal,” Release No: NR-045-18, Feb. 12, 2018. Accessed June 11, 2018. Available at: https://www.defense.gov/News/News-Releases/News-Release-View/Article/1438798/dod-releases-fiscal-year-2019-budget-proposal/. BBC News, “Xi Jinping: ‘Time for China to take centre stage,’” Oct. 18, 2017. Accessed July 12, 2018. Available at: http://www.bbc.com/news/world-asia-china-41647872. Ronald O’Rourke, “Maritime Territorial and Exclusive Economic Zone (EEZ) Disputes Involving China: Issues for Congress,” Report, Congressional Research Service, May 10, 2018. Accessed June 11, 2018. Available at: https://fas.org/sgp/crs/row/R42784.pdf. Energy Information Agency, “South China Sea,” May 18, 2018. Accessed July 12, 2018. Available at: https://www.eia.gov/beta/international/regions-topics.cfm?RegionTopicID=SCS. Council on Foreign Relations, “China’s Maritime Disputes.” Interactive Maps, May 18, 2018. Accessed July 12, 2018. 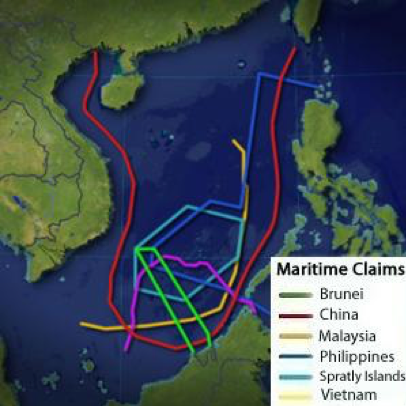 Available at: https://www.cfr.org/interactives/chinas-maritime-disputes?cid=otr-marketing_use-china_sea_InfoGuide#!/chinas-maritime-disputes?cid=otr-marketing_use-china_sea_InfoGuide. United States Department of Defense, Asia Pacific Maritime Security Strategy, June 11, 2018. Accessed July 12, 2018. Available at: https://www.defense.gov/Portals/1/Documents/pubs/NDAA%20A-P_Maritime_SecuritY_Strategy-08142015-1300-FINALFORMAT.PDF. Manuel Mogato, “Philippines says US military to upgrade bases, defense deal intact,” Reuters, Jan. 26, 2017. Accessed July 12, 2018. Available at: https://www.reuters.com/article/us-philippines-usa-defence/philippines-says-u-s-military-to-upgrade-bases-defense-deal-intact-idUSKBN15A18Z. Joshn Smith and Phil Stewart, “Trump surprises with pledge to end military exercises in South Korea,” Reuters, June 12, 2018. Accessed July 12, 2018. Available at: https://www.reuters.com/article/us-northkorea-usa-military/trump-surprises-with-pledge-to-end-military-exercises-in-south-korea-idUSKBN1J812W. United States White House, Remarks by the President at the Business Roundtable, Dec. 3, 2014. Accessed June 11, 2018. Available at: https://obamawhitehouse.archives.gov/the-press-office/2014/12/03/remarks-president-business-roundtable. United States White House, “Presidential Memorandum Regarding Withdrawal of the United States from the Trans-Pacific Partnership Negotiations and Agreement,” Jan. 23, 2017. Accessed June 11, 2018. Available at: https://www.whitehouse.gov/presidential-actions/presidential-memorandum-regarding-withdrawal-united-states-trans-pacific-partnership-negotiations-agreement/. Colin Clark, “Our Artificial Intelligence ‘Sputnik Moment’ is Now: Eric Schmidt & Bob Work,” Breaking Defense, Nov. 1, 2017. Accessed July 12, 2018. Available at: https://breakingdefense.com/2017/11/our-artificial-intelligence-sputnik-moment-is-now-eric-schmidt-bob-work/. Elsa Kania, “Battlefield Singularity: Artificial Intelligence, Military Revolution, and China’s Future Military Power,” Report, Center for a New American Security, Nov. 28, 2017. Accessed June 11, 2018. Available at: https://www.cnas.org/publications/reports/battlefield-singularity-artificial-intelligence-military-revolution-and-chinas-future-military-power. Eric Heginbotham et al., “China’s Evolving Nuclear Deterrent,” Rand Corporation, Report, 2017. Accessed June 11, 2018. Available at: https://www.rand.org/content/dam/rand/pubs/research_reports/RR1600/RR1628/RAND_RR1628.pdf. Ellen Nakashima, “Hacks of OPM databases compromised 22.1 million people, federal authorities say,” The Washington Post, July 9, 2015. Accessed July 12, 2018. Available at: https://www.washingtonpost.com/news/federal-eye/wp/2015/07/09/hack-of-security-clearance-system-affected-21-5-million-people-federal-authorities-say/?utm_term=.4e681f109415. Dorothy Denning, “How the Chinese cyberthreat has evolved,” The Conversation, Oct. 4, 2017. Accessed July 12, 2018. Available at: http://theconversation.com/how-the-chinese-cyberthreat-has-evolved-82469. Joshua Kurlantzick, “Australia, New Zealand Face China’s Influence,” Expert Brief, Council on Foreign Relations, Dec. 13, 2017. Accessed June 11, 2018. Available at: https://www.cfr.org/expert-brief/australia-new-zealand-face-chinas-influence. Eleanor Albert, “The China-North Korea Relationship,” Backgrounder, Council on Foreign Relations, March 28, 2018. Accessed May 22, 2018. Available at: https://www.cfr.org/backgrounder/china-north-korea-relationship. Justin Worland, “It Didn’t Take Long for China to Fill America’s Shoes on Climate Change,” Time, June 8, 2017. Accessed July 12, 2018. Available at: http://time.com/4810846/china-energy-climate-change-paris-agreement/.